May 19, 2016 – Airbus Defence and Space has started assembling the European Service Module (ESM), a key element of NASA’s next-generation Orion spacecraft that will transport astronauts into deep space for the first time since the end of the Apollo program. Integrating more than 20,000 parts and components in the ESM flight model ranging from electrical equipment to rocket engines, solar arrays, tanks for propellant and life support consumables as well as hundreds of meters of cables and tubes marks a major milestone for the Orion program. After the arrival of the flight model structure from Thales Alenia Space Italy the assembly is being carried out at Airbus Defence and Space’s site at Bremen, Germany, where officials from ESA, NASA, Airbus Defence and Space and partners gave an update on the Orion program’s progress on May 19. The second test flight of the Orion vehicle and its first atop NASA’s Space Launch System (SLS) rocket known is known as Exploration Mission-1. This 2018 mission will be uncrewed and travel more than 64,000 km beyond the Moon to demonstrate the spacecraft’s performance. The first crewed mission, Exploration Mission-2, will be launched as early as 2021. 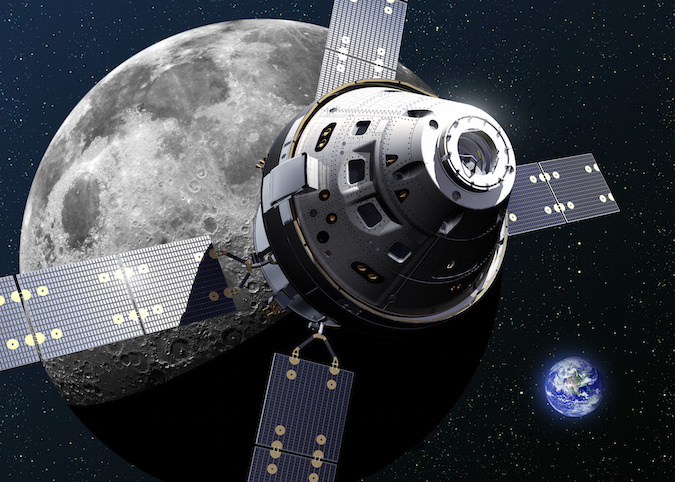 The Orion spacecraft is designed to take humans further than they have ever been before. The exploration vehicle will carry the crew to space, provide emergency abort capability, sustain the crew during space travel, and provide safe re-entry from deep space return velocities. Orion ushers in a new era of space exploration, with missions envisaged beyond the Moon, to an asteroid mass delivered to lunar orbit and Mars. The ESM is cylindrical in shape and about four meters in diameter and in height. It features the ATV’s distinctive four-wing solar array (19 meters across unfurled) that generates enough electricity to power two households. Its 8.6 tons of propellant will power one main engine and 32 smaller thrusters. The ESM has a total mass of just over 13 tons. In addition to the main propulsion capability for the Orion spacecraft, the ESM will perform orbital maneuvering and attitude control functions. It also provides the main elements of the life support system such as water and oxygen for the crew while providing power and thermal control while it is docked to the crew module. The unpressurised service module can also be used to carry additional cargo. In managing the development and construction of the ESM, Airbus Defence and Space is drawing on its extensive experience as prime contractor of ESA’s Automated Transfer Vehicle (ATV), which made regular deliveries of experiment equipment, spare parts, food, air and water for the crews on board the International Space Station.